The second edition of the Pocket Guide is designed to work as a clinical handbook and up-to-date reference for nurses when interviewing patients of all age groups and cultural backgrounds, taking health histories, promoting health, and performing physical assessments. The content derives from and has been developed in conjunction with Jensen's Nursing Health Assessment: A Best Practice Approach and serves to both review the core content provided in the textbook as well as help students apply their foundational learning through reinforcement and streamlined presentation. The content focuses on key questions in the area of health promotion, reviewing important risk factors and outlining essential teaching points for risk assessment and intervention. 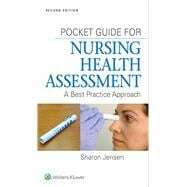 It includes essential questions to review common and concerning signs and symptoms for each health assessment topic. The chapters review the key techniques of examination, outlining normal and unexpected findings. Finally, tables of findings provide a quick reference by which students can compare and contrast results to assist with eventual nursing and medical diagnoses.